WASHINGTON — SpaceX conducted its seventeenth launch of the year Oct. 7, sending an Argentine radar satellite into low-Earth orbit on a Falcon 9 rocket. The mission was also SpaceX’s first to include a successful land recovery of the rocket’s booster stage at Vandenberg Air Force Base in California. All previous recoveries in California used a drone ship to land boosters out at sea. The Falcon 9 Block 5 lifted off at 10:21 p.m. Eastern during an instantaneous launch window. The satellite, Saocom-1A, separated from the launcher’s upper stage about 13 minutes later. SpaceX landed the rocket’s first stage at a newly built landing pad called LZ-4 that is located near Vandenberg’s SLC-4E launch pad where the rocket took off. The company views ground-based rocket landings as better for expediting reuse, since drone ship landings require time to return to port. 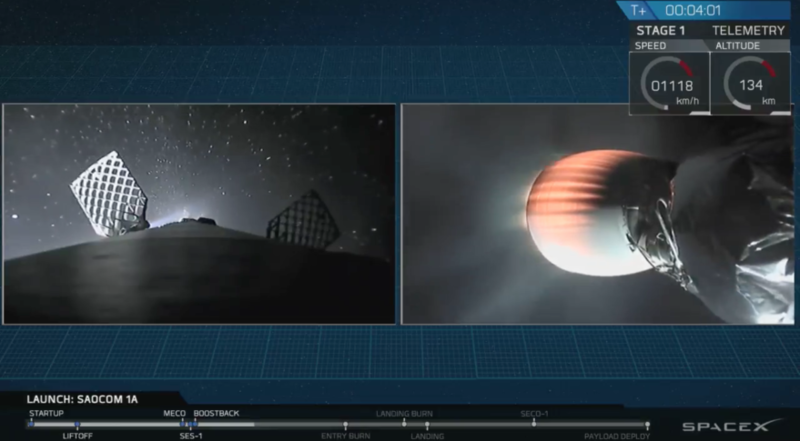 SpaceX used the same first stage for the Saocom-1A mission that launched 10 satellites for Iridium about 10-and-a-half weeks ago, also from Vandenberg. Saocom-1A is a 3,000-kilogram synthetic aperture radar (SAR) satellite for the Argentine space agency CONAE that was contracted in 2009 for a launch in 2012. By that year the launch had slipped to 2014, and would continue to slip further as Falcon 9 explosions in 2015 and 2016 compounded earlier delays. CONAE was one of the company’s first customers, signing up for two Falcon 9 launches back when SpaceX had only flown the smaller Falcon 1 vehicle. At the time, the launch was scheduled to occur from the Kwajalein Atoll in the Pacific Ocean where SpaceX launched the now retired Falcon 1. Argentina’s domestic satellite manufacturer INVAP built the satellite with assistance from other agencies and domestic companies. NASA and the space agencies of Europe, Italy and Canada also provided technical support. Saocom-1A has an L-band payload designed to study soil moisture for agriculture, disaster monitoring and scientific research. CONAE will operate the satellite as part of the Argentine-Italian System of Satellites with the Italian Space Agency, coordinating observations with Italy’s four Cosmo-Skymed X-band SAR satellites. The Saocom-1A launch places SpaceX one mission away from tying its record of 18 launches in one year, set in 2017. SpaceX has several other missions planned for this year, including the Falcon 9 launches of another 10 Iridium Next satellites, Es’hailSat’s Es’hail-2, and the U.S. Air Force’s first GPS-3 satellite. SpaceX has a second CONAE satellite, Saocom-1B, that it is also tasked with launching. That nearly identical satellite will launch in “the near future,” also on a Falcon 9, according to the mission narrator for the Saocom-1A webcast.